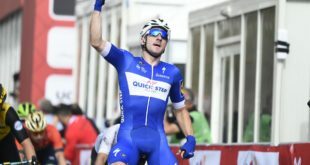 Eschborn-Frankfurt 2018 is the World Tour racing seasonal debut in Germany. The one-day event that traditionally takes place on May 1st has come to the fifty-sixth edition in its history. The Labour Day competition has been promoted to World Tour category last year and the 2018 race is the second with the current status. Twenty teams will take part to the competition. AG2R La Mondiale, Bahrain Merida, Bora Hansgrohe, Lotto Soudal, Quick Step Floors, Team Katusha-Alpecin, Team Sunweb, Trek-Segafredo and UAE Team Emirates will participate in addiction to 11 Professional teams. Eschborn Frankfurt organizers may have devised the idea of making the German classic a tougher bone to swallow. In the past this event has been a sprinter-friendly one despite being a quite demanding race. 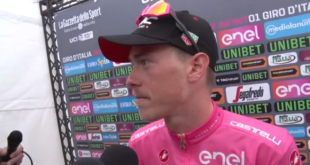 To demonstrate this trend is enough to say Alexander Kristoff and Erik Zabel share the record of three successes on the finish line. By the way Mammolshein up-hill has always been part of the route in the past few years and whoever has won this race avoiding the bunch sprint attacked on this climb. The 2018 route is no exception. 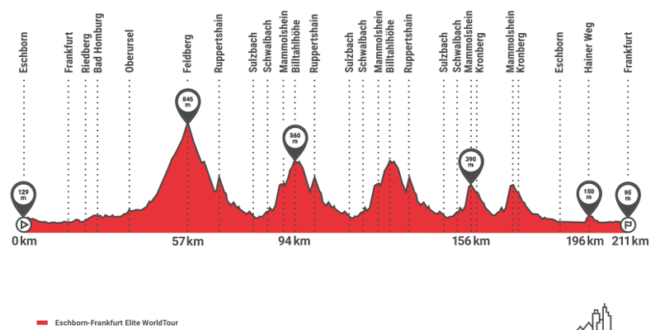 Mammolshein climb is still included in the Eschborn Frankfurt 2018 course but few changes have been made. 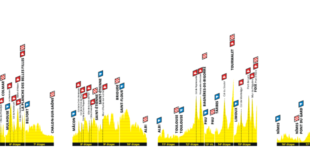 The event runs from Eschborn to Frankfurt and features 212 kilometers of racing and 3500 meters in elevation in total. Irrilevant with a view to the final results, the first climb to be hit is Feldberg (10 km, 5,0% average gradient). Despite it’s got the makings of a real climb its bottom stands with only 47 kilometers from the start and it is only a chance to shoot nice pics. 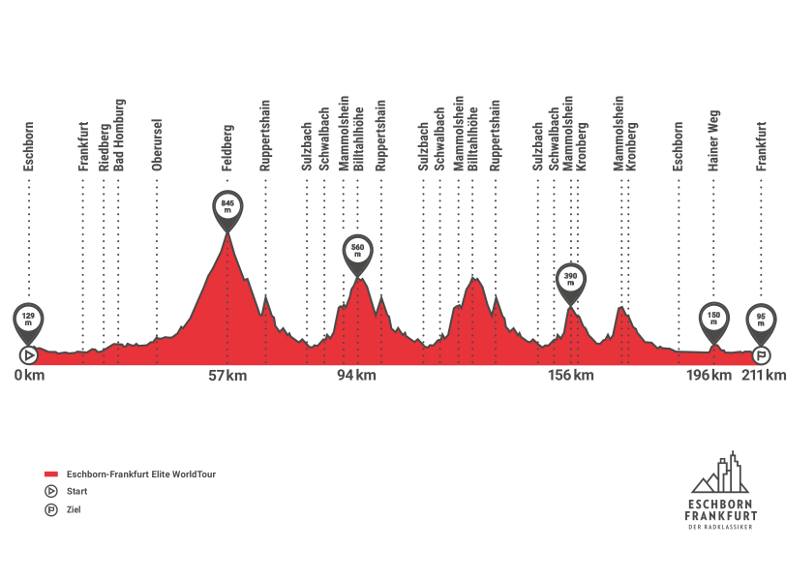 As soon as the descent from Feldberg summit comes to an end, the race engages Ruppertshain hill (1.3km, 6.7%) before heading to Schwalbach, where the climb to Billtalhöhe (3.5km, av. 5,7%) begins. The race is covering this up-hill twice in a row: at first with 121 km to go, then with over 88 kilometers remaining. Both times the lap ends with Ruppertshain hill (1.3km, 6.7%) before descending to Sulzbach. The race hits a partially new circuit with 57 kilometers to go. The time has come for the Mammolshein up-hill (1.0km, max 23.0%). This brief but steep ascent represents the first half of Billtalhöhe climb and it has been the traditional launch pad for the attackers before the flat finale. This circuit is repeated twice and the finish line, once the last lap is concluded, is 40 kilometers far from the summit of Mammolshein. Along the last flat 40 kilometers of racing everything could happen: the ones who succeed in going clear can be capable of keeping their advantage to the finish line same way the group can reel in the leaders and settle the bunch sprint. 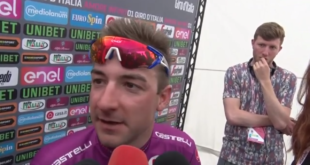 By the way this is the characteristic that has always set this race: it is unpredictable which kind of rider is going to achieve the success.